14:00-17:00 Maastricht, Bonnefantenmuseum: Registration, tea, opening, visit new display of Flemish paintings on long-term loan from the Rijksmuseum. 17:00 Departure by bus for Brugge, 212 km. 19:30 Arrival, check in to hotel. Rooms have been reserved in the adjoining Ibis Hotel and Novotel, on the Katelijnestraat. 20:00-21:30 Reception in the Memlingmuseum, hosted by Hilde Lobelle-Caluwé, chief curator. Although it requires no explanation that CODART should meet in Brugge, where it all began, the decision to go there in 2002 was clinched by the Jan van Eyck exhibition and the fact that the city is one of the European Cultural Capitals for the year of 2002. The town is taking this distinction very seriously, and has invested heavily in restorations and events. Participants in CODART VIJF will receive complete programs of Brugge 2002. In the meantime, see http://www.bruggeplus.be/. 09:00-12:30 Memlingmuseum, attic. Congress session with two coffee breaks. Report of the program committee: Charles Dumas. Presentations by members, mainly of future exhibitions for which they are seeking partners. Lia Gorter, Foundation for Cultural Inventory, Amsterdam: “Netherlandish elements in Polish art,” a book in preparation, tied in to CODART ZEVEN. Jochen Luckhardt, Herzog Anton Ulrich-Museum (HAUM), Braunschweig: “The history of the HAUM and the acquisitions of 17th-century art by Herzog Anton Ulrich (1633-1714).” Collaborative project with the University of Amsterdam. Ivan Rusina, Slovak National Gallery, Bratislava: “Rembrandt and 17th-century Dutch art in Slovak collections.” A catalogue and exhibition for September-October 2003. Sander Paarlberg, Dordrechts Museum: “Hunting trophies, letter racks, notice boards and printboards, chantournes (cutouts) and illusionistic motifs.” An exhibition on trompe l’oeil in the 17th century planned for 2006-07. In 2005 Boudin and Jongkind are on the program, and after 2007 it will be time for Samuel van Hoogstraten. Paul Vandenbroeck, Koninklijk Museum voor Schone Kunsten, Antwerp: “Between Bosch and Brueghel: Jan & Frans Verbeeck. A previously unknown set of paintings with a unique iconography.” Exhibition in autumn 2003 or later. 14:00-18:00 Visits to museums, churches, historical sites and cultural institutions in Brugge. With the exceptional cooperation of the municipal museum administration, which runs eight museums, we will be taken in groups, guided by our Brugge colleagues, to the most interesting destinations in the city. In the course of Monday and Tuesday afternoon, each participant in the congress will be able to visit a choice of the locations below, to be worked out in a roster offering various choices. For this opportunity and for the efforts they have exerted on our behalf, we are deeply grateful to the directors of the Brugse Musea, our member Manfred Sellink and his co-director Walter Rijcquart, and their staff. For information and images on the destinations, see the Brugge city website. The texts are also available in a brochure on the museums of Brugge, which will be distributed to participants. N.B. Each participant may choose one section for each day. The visit to the Steinmetzkabinet and the restoration studios and storage spaces of the Memling- and Groeningemuseum may be attended by all participants, since they will be repeated, and the group will be split into two each day. The other sections will be filled on the basis of the order of receipt of registration forms. A. Brugge in historical perspective, guided by Stéphane Vandenberghe, curator of the Gruuthuse Museum and of Brugge historic heritage. T +32 50 448 706. Onze-Lieve-Vrouwekerk. “Church of Our Lady (13th-15th century): this church, with a 122 m high tower, contains an extremely rich art collection. Top of the bill is of course the white marble Madonna with Child by Michelangelo. In the choir gallery are the mausoleums of Mary of Burgundy and Charles the Bold, as well as a number of remarkable polychromed tombs (13th-14th century). ” The chapel of Lodewijk van Gruuthuse. B. The hofjes and archive of Brugge, guided by Dr. Noël Geirnaert, archivist. T +32 50 448 264. The city archive, among the most important repositories of their kind in the Netherlands. The visit will concentrate on sources concerning painters, and the collection of illuminated manuscripts. C. Popular culture. Guided by Willy P. Dezutter, curator of the Museum voor Volkskunde, and Sibylla Goegebuer, associate curator of the museum and Hoofdman of the guild. T (provisional): +32 50 330 044. Museum voor Volkskunde. “The restored and picturesque 17th-century almshouses belonging to the Bruges cobblers’ coroporation evoke the atmosphere of bygone days. Historic objects are used to reconstruct a classroom, a cobbler’s and a hatter’s workshop, a Flemish living room, an old kitchen, a confectioner’s and an old chemist. The numerous folkloric exhibits include a large collection of pipes, examples of old costume and items relating to popular worship. Visitors can round off their tour in the museum inn, The Black Cat.” Three new rooms reconstruct the cloth trade. A complete glassblowing establishment and a historic bedchamber are incorporated into the museum. The St. Sebastiaansgilde Museum. As an institution, the guild of St. Sebastian, whose weapon was the crossbow, was probably founded in the 14th century. The picturesque brick building and tower, at the corner of the Carmerstraat and the city wall, dates from the second half of the 16th century. The most representative room, the hall for meetings and banquets, was donated to the guild a century later by King Charles II of England. The St. Sebastiaansgilde has also retained its practice ranges, including a wooden gallery adorned with stained-glass windows and old targets. In the banquet hall, called the Koningskamer, hang the group portraits of the guild and its governors from the 17th century on. The guild furniture and silver has also been preserved in the original building. The St. Jorisgilde Museum. Located in the former Jong Hof of the guild of St. George. It was instituted after the disbanding of the guild in 1876, with historic relics, art works and weapons from both the Oud and the Jong Hof that constituted the guild. D. Behind the scenes of the Brugge museums. Guided by Willy Le Loup, curator of the Groeningemuseum, Eva Tahon, head of the conservation department of the Brugge Museums, and their associates. N.B. This visit will be made available to all participants. It will be held on Monday as well as Tuesday, for two groups of 20 each day. Steinmetzkabinet. The printroom of the Gemeentemusea Brugge is named for the “Brugse Brit” John Steinmetz (1795-1883), who donated his collection of 17,000 prints and drawings to the township in 1864. In 1954 the holdings of the former Oudheidkundig Genootschap were added to the collection, which further consists of historic possessions of Brugge and other legacies, donations and acquisitions. The best pieces, including drawings by Gotzius and de Gheyn and prints by Dürer and Callot, will be put on display for participants in CODART VIJF. The restoration studios and reserves of the Memling- and Groeningemuseum. 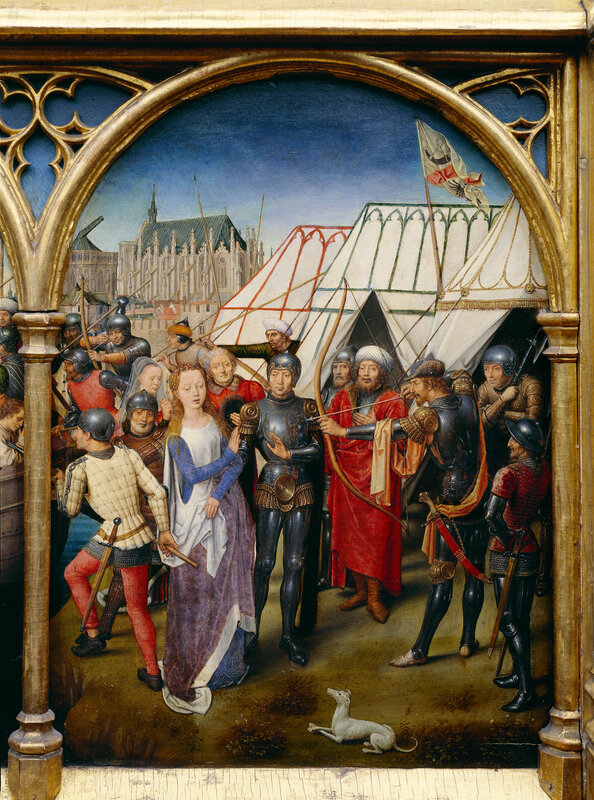 09:15-12:30 Memling Museum, attic: Early Netherlandish art and its dispersal. Congress session with two coffee breaks. Chair: Stephen Hartog. Jan van Eyck en de mediterrane wereld: een nieuwe kijk op de Vlaamse Primitieven (Jan van Eyck and the Mediterranean world: a fresh view of the Flemish Primitives; Brugge, Groeningemuseum; 15 March-30 June), curated by Till-Holger Borchert. Heerlijke Primitieven. meestertekeningen van Jan van Eyck tot Hiëronymus Bosch (Delightful primitives: master drawings from Jan van Eyck to Hieronymus Bosch; Antwerp, Rubenshuis, 14 June-18 August), curated by Fritz Koreny and Georg Zeman. Meesterlijke middeleeuwen: miniaturen van Karel de Grote tot Karel de Stoute (800-1475) (The masterly Middle Ages: miniatures from Charlemagne to Charles the Bold (800-1475); Leuven, Stedelijk Museum Vander Kelen-Mertens; 21 September-8 December), curated by Jan Van der Stock. We are fortunate in having been able to bring the curators of these exhibitions to CODART VIJF. They will speak on their exhibitions, on the state of scholarship in the respective fields of the exhibitions, and of course on the art itself. A. The earliest traces of Brugge. Guided by Hubert De Witte, archaeologist, and Bieke Hillewaert, scholarly associate of the Brugge Museums. T +342 50 448 705 and +32 50 448 709. Beneath the Burg. The construction of a hotel near the former residence of the Counts of Flanders revealed major archaeological remains of the rich past of Brugge. The Archaeological Service has identified traces of the church of St. Donatus, late medieval tombs and a well. The workshop of the Archaeological Service, with a display of choice items. The excavations and wall paintings in the Onze-Lieve-Vrouwekerk. B. Hidden treasures of Brugge. Guided by Brigitte Beernaert, scholarly associate of the Monument Service, T +32 50 472 382, Kurt Priem, archivist of the Groot Seminarie, and Mieke Parez, associate curator of Onze-Lieve-Vrouw ter Potterie. City walk to lesser-known monuments: the Burg, with its mélange of Flemish architecture of all periods, the rococo façade of a bank with a collection of 18th-century paintings, the new town theater, the Hof van Bladelin. “Bladelin Court: built ca 1440 by Pieter Bladelin, treasurer of the Order of the Golden Fleece. The walls surrounding the charming inner garden show nice stone medallions representing portraits of the former inhabitants.” The Bladelin Court can be called the headquarters of the Medici in Brugge. The Groot Seminarie, which owns a major collection of illuminated manuscripts and several early paintings as well. Later in the year it will host the exhibition Besloten wereld, open boeken (A cloistered world, an open book), in which medieval manuscripts will be shown alongside art by our own contemporaries. C. Behind the scenes of the Brugge museums. Identical to visit D. on Monday. 17:00-21:00 In small groups, visit to Jan van Eyck, the Flemish primitives and the South (1430-1530), three days before opening. This exhibition demonstrates the extent to which the pioneering work of Flemish artists in the 15th and 16th centuries was influenced by developments in other European countries. This influence came not only from artists but also from the dynastic interests of rulers such as the House of Burgundy. Some sections of the exhibition are iconographic: the Passion of Christ, the Virgin in artistic imagery. Others focus on more structural or general themes, such as the emergence of landscape, civic and personal identity, the imagery of the other. Monographic, topographic and chronological sections give the visitor a clear impression of the impact of Italiy and southern Europe on Flemish art. This approach leads to the reopening of some controversial attribution debates. The displays include iconic works of 15th-century art alongside new discoveries. The collections of Brugge itself provide the perfect starting point for this fresh presentation of the Flemish primitives, with Jan van Eyck as the key figure. 11:00 Bus leaves for Kasteel van Loppem. 11:15-12:15 Kasteel van Loppem, an extraordinary recreation of a medieval palace. “Baron Charles van Caloen ordered the architect Baron Jean Bethune to complete the unfinished plans of the London architect Edward Pugin and to build this neo-gothic château intended to reflect the mysticism and grandeur of bygone Flanders. It was here in 1918, at the end of the Great War, that King Albert signed the law granting the long sought universal suffrage. The château contains a number of neo-gothic works, including paintings, porcelain, etc, from the 16th and 17th centuries. Also displayed is the Jean van Caloen collection of religious sculptures dating between the thirteenth and sixteenth centuries from Holland, France, Italy, Spain and Germany.” The castle is ordinarily not open until April, but our member Véronique van Caloen will open it for us and receive us in her family castle. 12:15-13:30 Lunch in the cellar of the castle. 13:45-14:45 Bus to Antwerp, Leopold de Waelplaats, 100 km. 15:00-18:00 KMSKA: Joint session with Historians of Netherlandish Art (HNA): Looking and learning. Netherlandish art in museums and universities, 1902-2002-2102. Welcome by Paul Huvenne, director of KMSKA and Gary Schwartz, director of CODART. Introduction by moderator of panel discussion: Jeroen Stumpel, professor of iconology, University of Utrecht . Museum speaker: Ivan Gaskell, curator at Fogg Art Museum and lecturer at Harvard University. Academic speaker: Koen Ottenheym, professor of architectural history, University of Utrecht and director of the Onderzoeksschool Kunstgeschiedenis. Katlijne Van der Stighelen, professor of art history, Catholic University of Leuven. Tea break, audience submits written questions. Discussion between speakers and panel members. HNA in Antwerp. See www.hnanews.org.